Yes, it is Saturday. It’s also #Caturday if you are a fan of the felines and you want to contribute to or simply scroll through the roughly 7.5 million photos with that hashtag on Instagram. 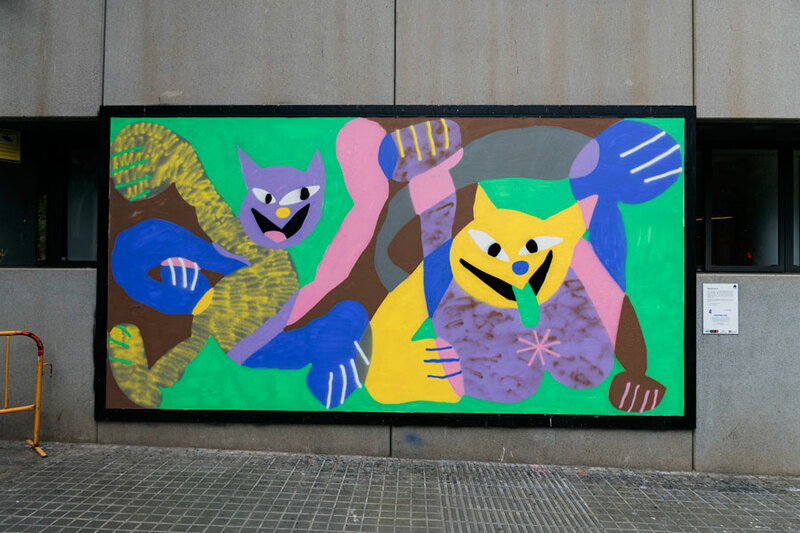 This Spanish cat named Tommy looks like he could have belonged to Matisse, due to the overlapping abstract collage method, but British artist Christina Lina says he was her grandmother’s cat – so we guessed wrong. 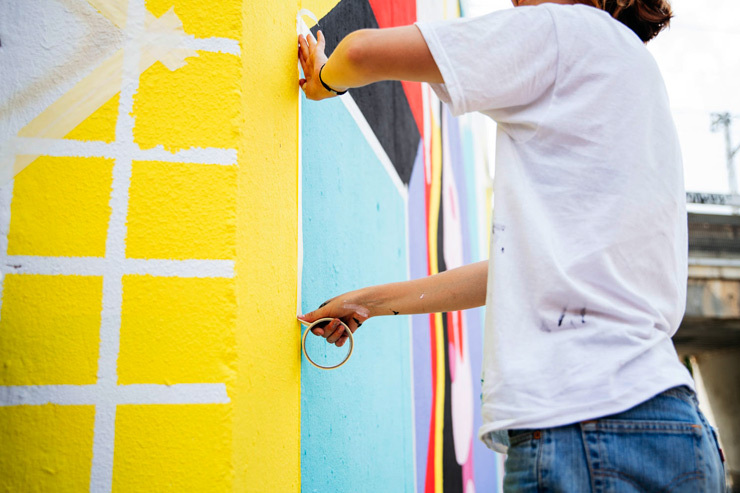 The artist and educator often creates props, temporary sculpture, and installations for kids and places they frequent, and finds her work easily moves from public to private space and back again. 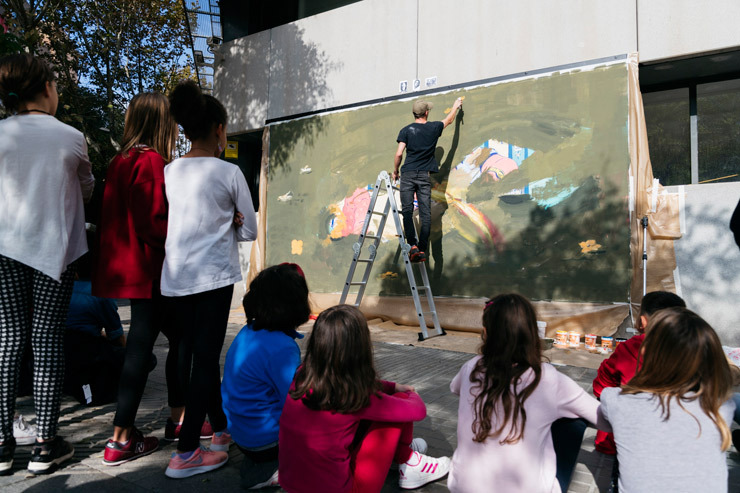 This mural part of a public art program done in concert with local Ferran Sunyer school (so-named after the mathematician) in a neighborhood of Barcelona and students had the opportunity to create puppets during the final phase of the program. 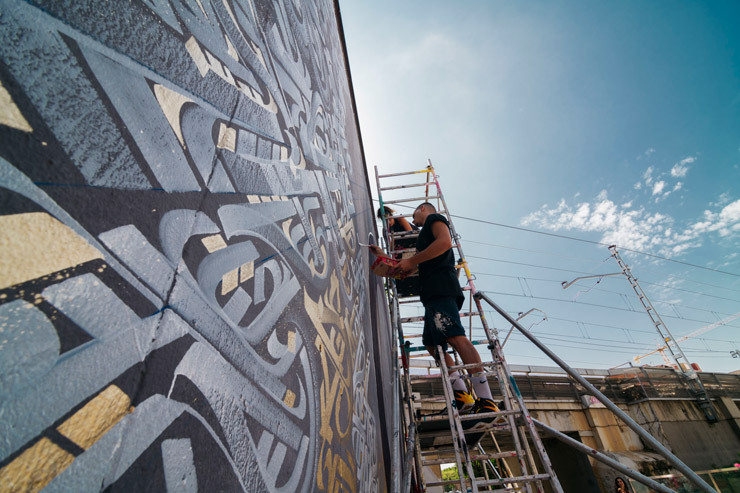 With special thanks to the 12 + 1 walls program by Contorno Urbano. 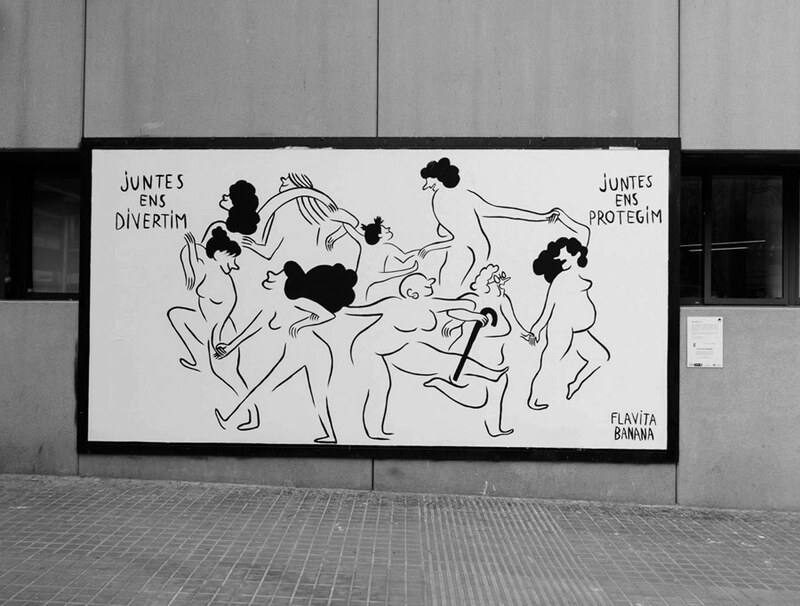 With a nod to La Danse by Henri Matisse and many human tribes’ rites of Spring, artist Falvita Banana creates her new “Juntes sumem” (add together) here on the façade of Cotxeres Borrell in Barcelona. 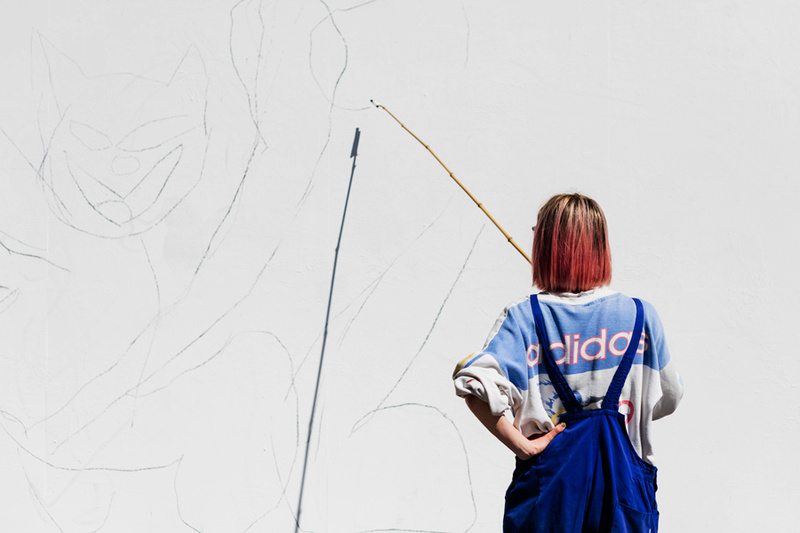 Her illustrations have been in magazines, books and on public walls, often with the most basic and courageous technique at play; the simple stroke in monochrome. Humor, absurdity, melancholy all are intertwined. Here the expansive commanding of space and convivial craze infers the spirit as well as the movement of these celebrants. But as with many of her humorous works, she says that this new wall completed Wednesday has a sadness – the clan-like closeness on display is for safety as well as intimate sisterhood. 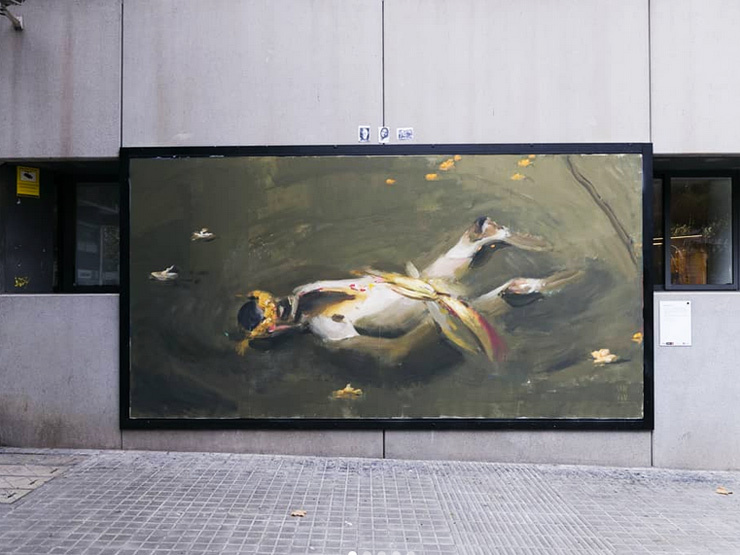 Created in conjunction with the public art project Contorno Urbano in Barcelona. 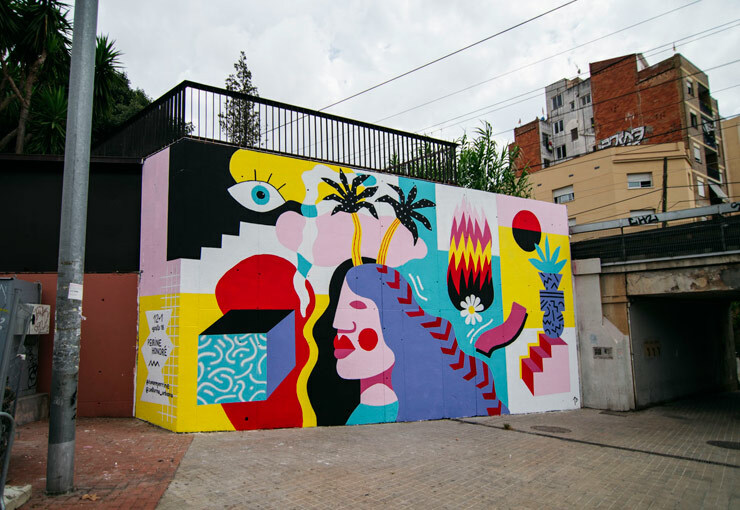 Saturday fun today from local Barcelona graphic designer Núria Toll, who’s sort of new to the experience of doing murals and art on the street. 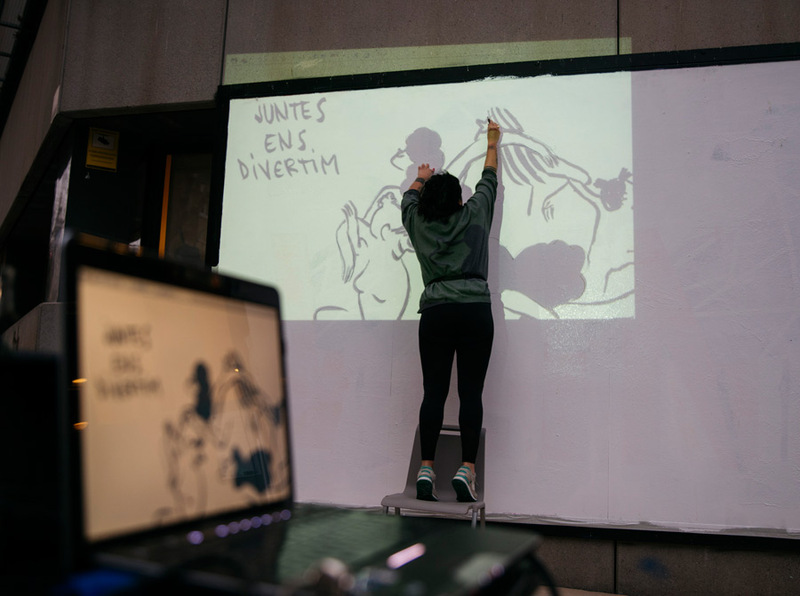 Translating her own history with illustration and typography, Ms. Toll finds that humor is a welcome antidote to the negativity that is produced by our invasions of animals’ natural habitats. 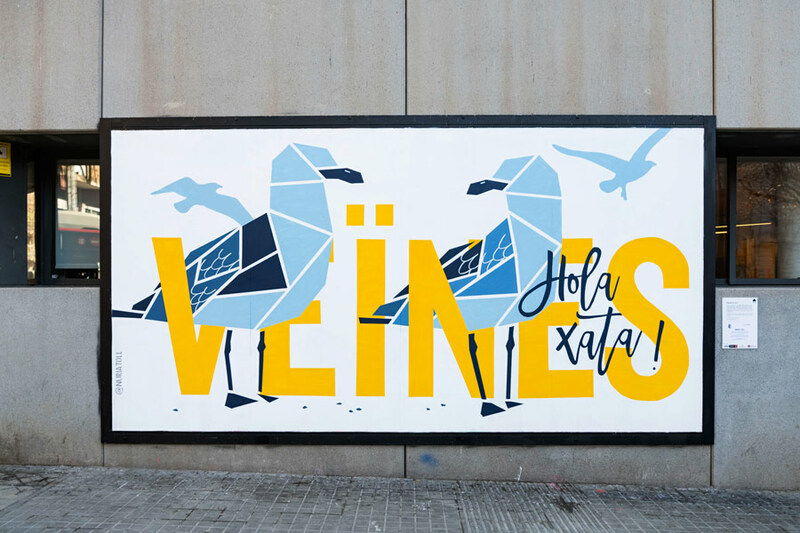 Here with “Veïnes” (female neighbors in Catalan), her seagulls are meant to remind us that the natural world was here first, and we should make a home for all of us. The seagulls are rather good at integrating, and Toll here is giving them their due. 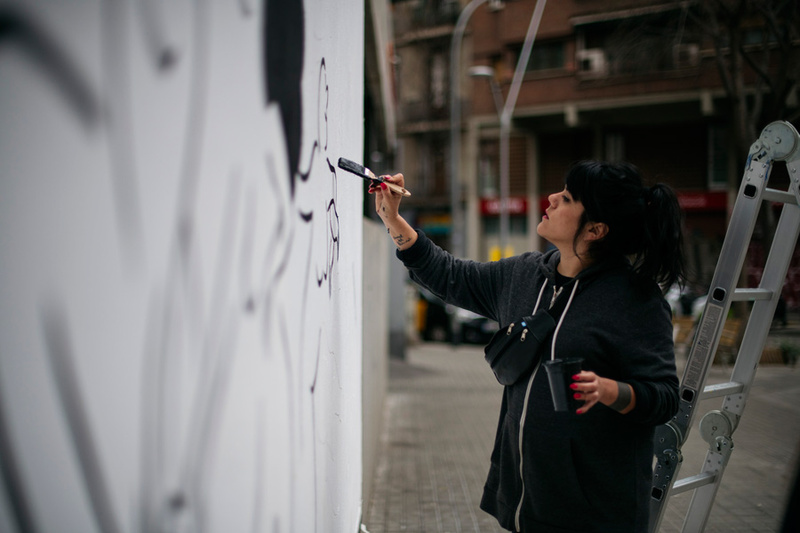 Núria Toll paints here for Contorno Urbano, the first foundation in Spain dedicated to street art and graffiti. 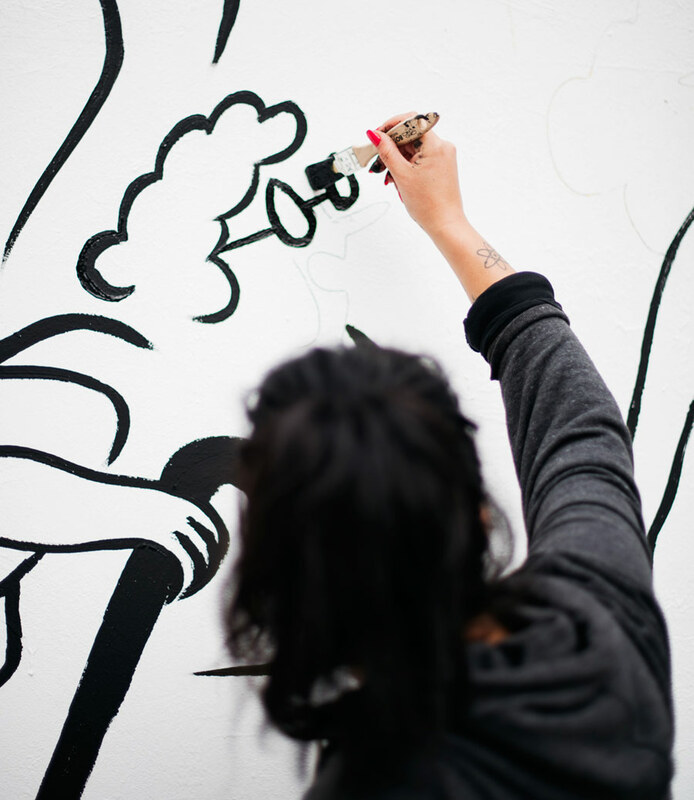 Part of the experience of making art in the street is the interaction with people passing by. 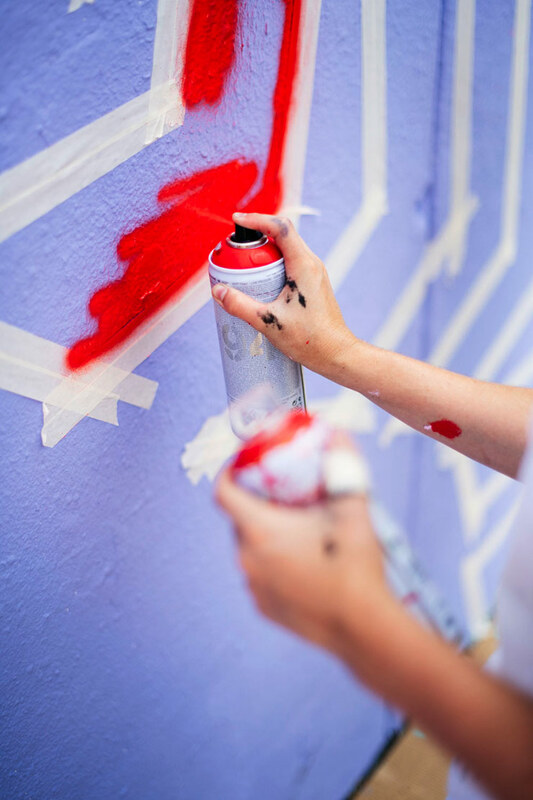 Other times it’s about being out with your mates or peers, hitting up walls that are near each other – sharing opinions, jokes, paint. Of course when you are in your own creative zone you also may be able to block out everything; people and sounds and smells. 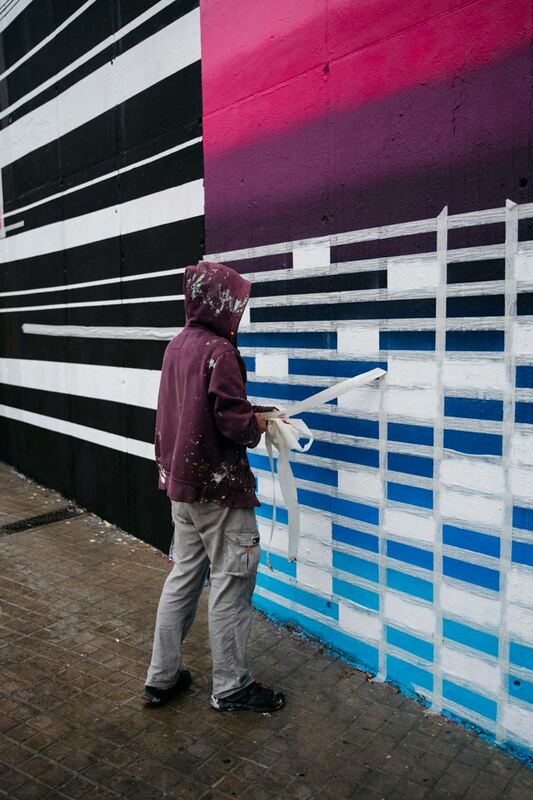 You escape into the paint, the movement, the physicality, the shapes and colors. 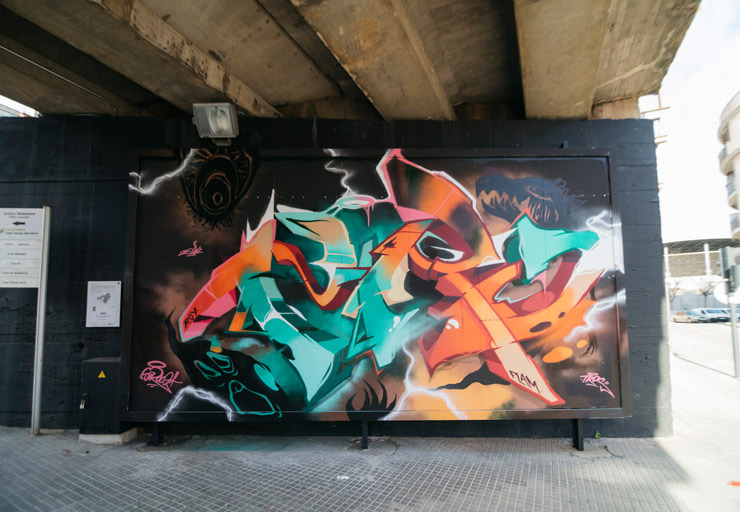 This month Musa71 and Siro hit a tunnel together in in Rafael Casanova in Barcelona, each painting their own piece. 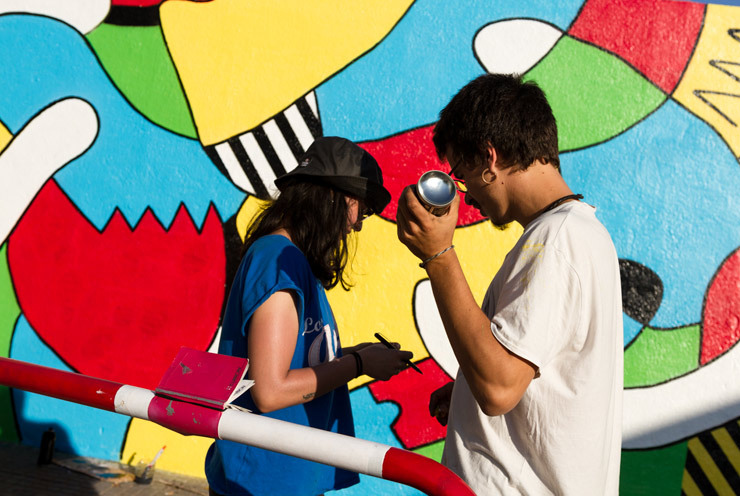 They say they liked it and today we have pictures from their dual project – which turned into a friendly competition. 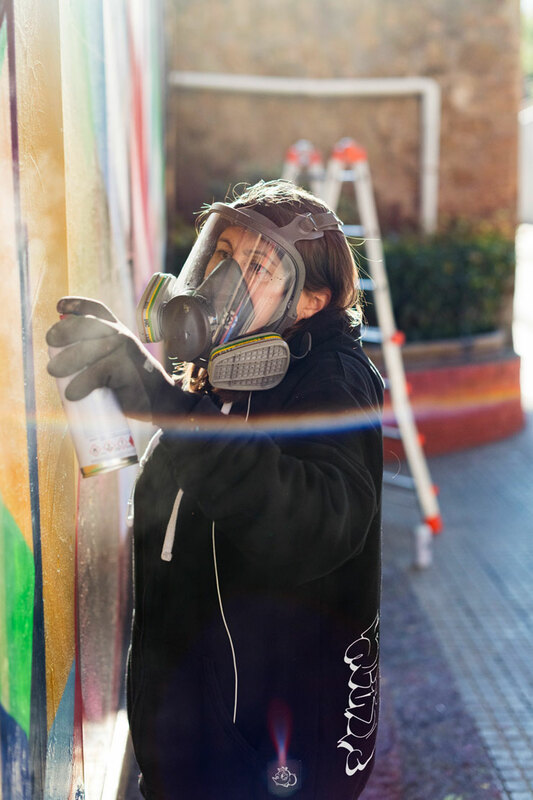 Writing graffiti since ’89, Barcelona local Musa71 says she’s a self-taught artist who is passionate about the letterform and exploring a number of styles just to get an appreciation for ways to manipulate them while keeping them legible. 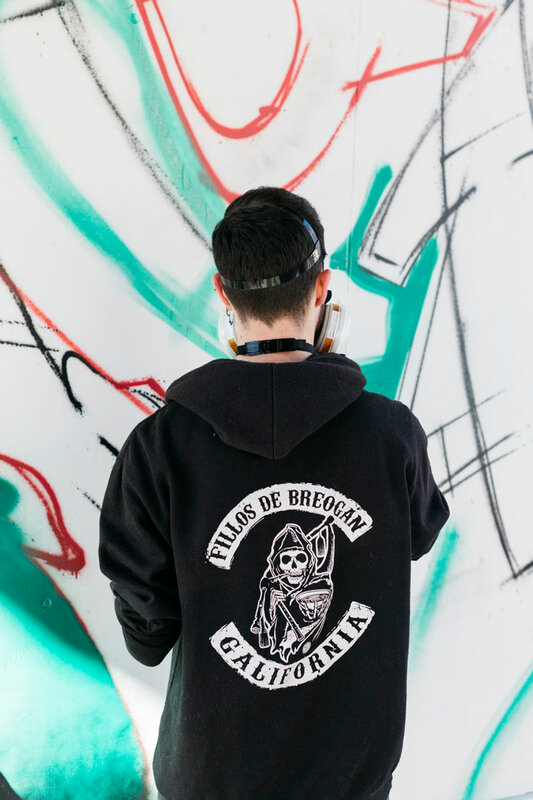 Galicia born Siro studied fine arts over the last four years here in Barcelona and he says that he spends a lot of time painting and tattooing. 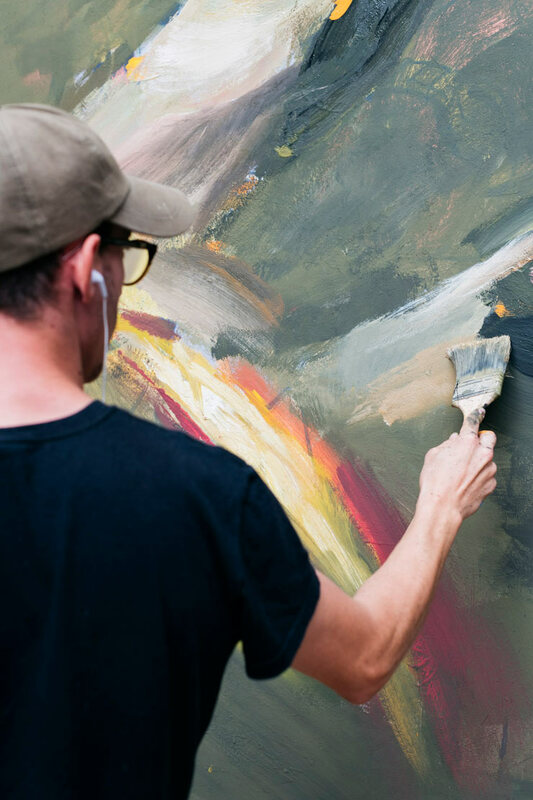 “After 10 years of painting, I think I have already turned this habit of painting into my little shelter, into an escape route from all the rest,” he says in a press release. 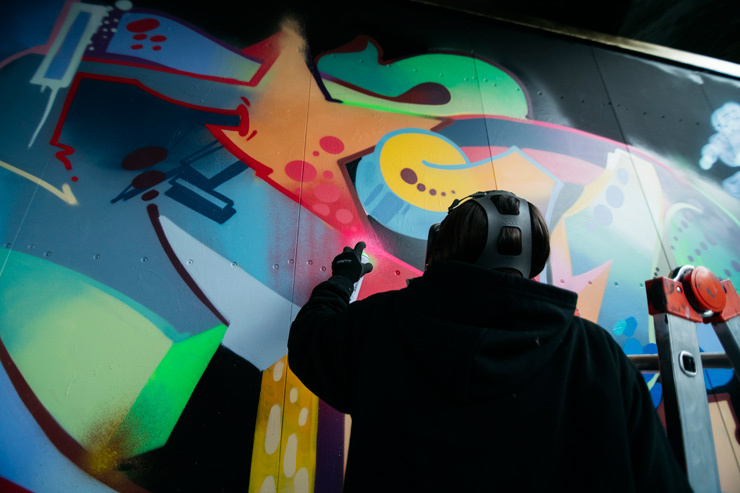 He wouldn’t be the first to admit to developing an addiction to graffiti and mural making – we’ve met many. It’s good to see how these two artists work have some overlap – at least here in this tunnel in Barcelona. 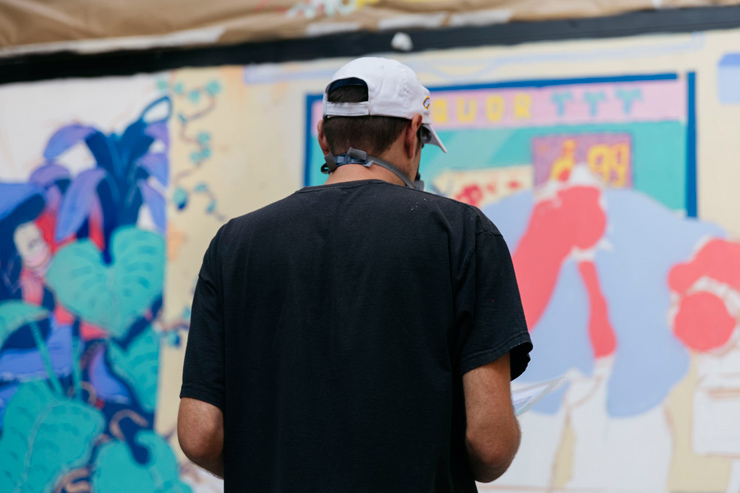 “I wanted people to feel what I feel: The joy of life,” says JonOne in this self narrated video that keeps the focus on the creative spirit and his new show “Illuminating the Future” in Rabat, Morocco’s capital, which rests along the shores of the Bouregreg River and the Atlantic Ocean. The kinetic action of his strokes and splashes are gestural bolts of energy at the top of this tower to be seen on all sides, an abstract beacon from this New York graffiti writer who metamorphosed into a Parisian fine artist. 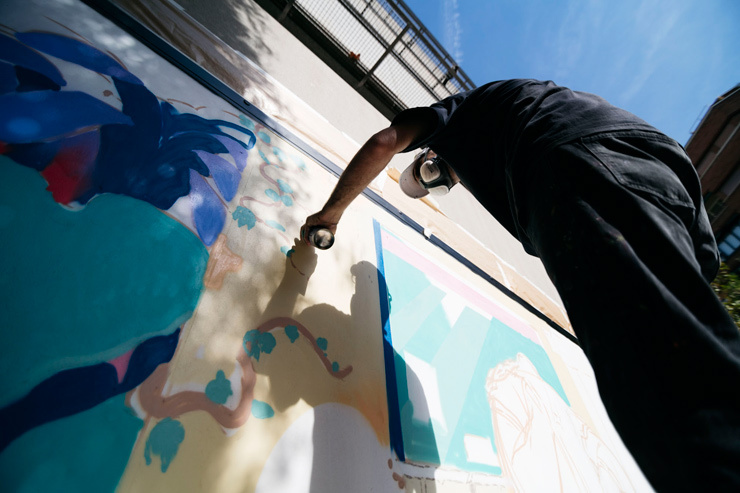 “Leave the rationality of your brain and listen to your heart, what you feel, what vibrates,” recommends ASU the muralist painting the Contorno Urbano wall in Barcelona – as we wrote in September. 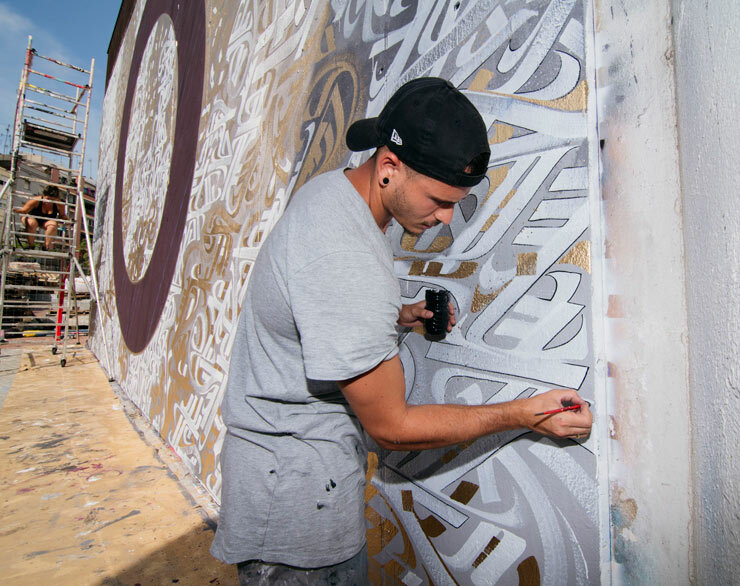 Now comes the newly release video to give more context to his techniques as a calligraffitist. “America is dying because they forgot the instruction of how to live on Earth,” says the wise voice weaving across this minimalist tableau in monochrome and quietly thundering beats. Succinct, brief, hard hitting, well paced and scored – ultimately a missive of power and stark symbology from Aether Films. A uniquely spare documentation of the meditated, deliberate, and dangerous application of straight down pixação, São Paulo style, on the side of this Montreal building. How it is received in this northern part of the the Northern Hemisphere is not told, but as the drone camera rises to catch the cityscape, a mural by Kevin Ledo of Leonard Cohen in his old neighborhood of Saint-Laurent takes the stage and you may wonder how that man of letters would see these new symbols, now two years after his passing. The Ganga and Godavari rivers feature the largest gathering of humanity every three years when literally tens of millions of visitors bathe in them peacefully and reverentially, in accordance with Hindu tradition for Kumbh Mela. People join religious discussion, sing, and see some of the most revered holy men and holy women there. Import it to Barcelona, Spain and this image feels out of context. The sadhu (or saddhu) is a religious monk – a sacred holy man in India. But how did he get here for the month of November? 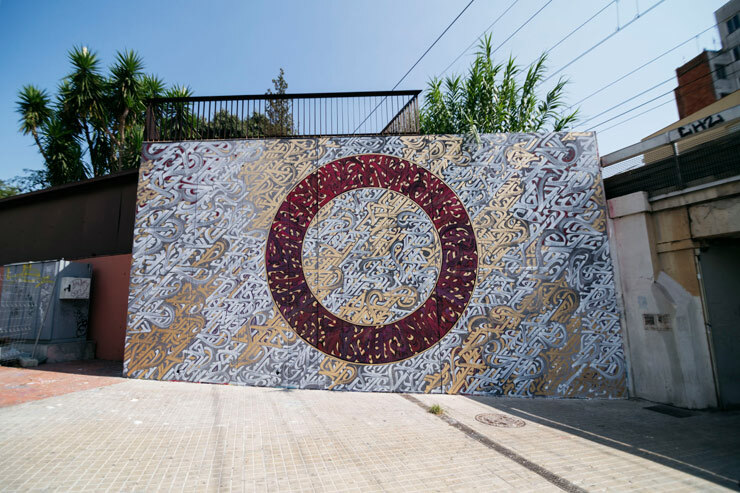 Artist Ivan Floro says he was considering the Hindu lights festival Diwali and the holy practice of bathing when he was creating his wall for the Centre Cívic Cotxeres Borrell. 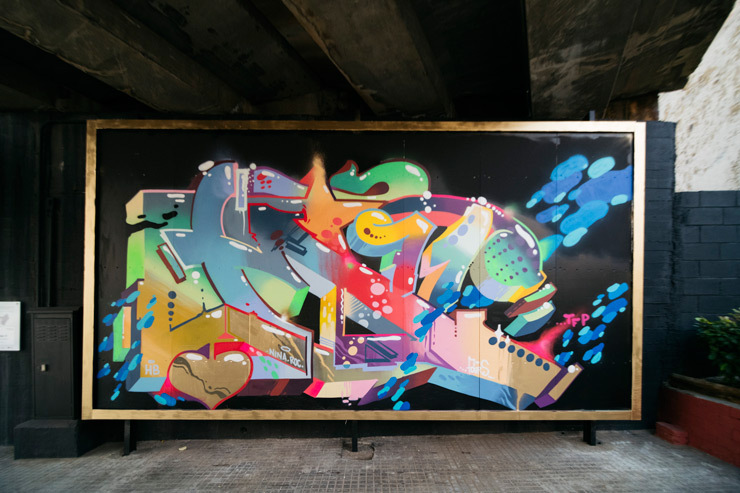 He calls it “Sacred Waters | पवित्र पानी” and his academic interpretation of his work is an evolution from his graffiti work as kid spraying abandoned factories. Now he studies the old European master painters and those traditions, bringing to fore this powerful piece that may be confusing to some who don’t know about the bathing holy practice thousands of miles from Barcelona. “I thought about the clash of cultures there is between East and West,” he says, “how they understand life and death. We celebrate some of their rituals, but we could be shocked buy some others”. 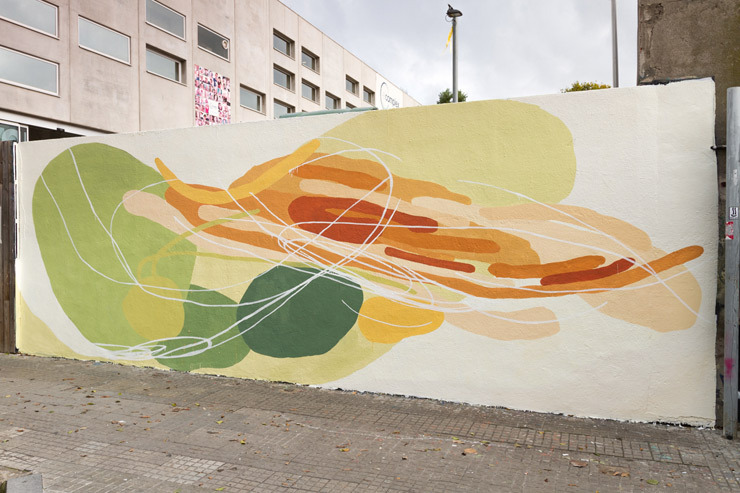 This wall was produced with the Contorno Urbano Foundation – 12 + 1 Project. 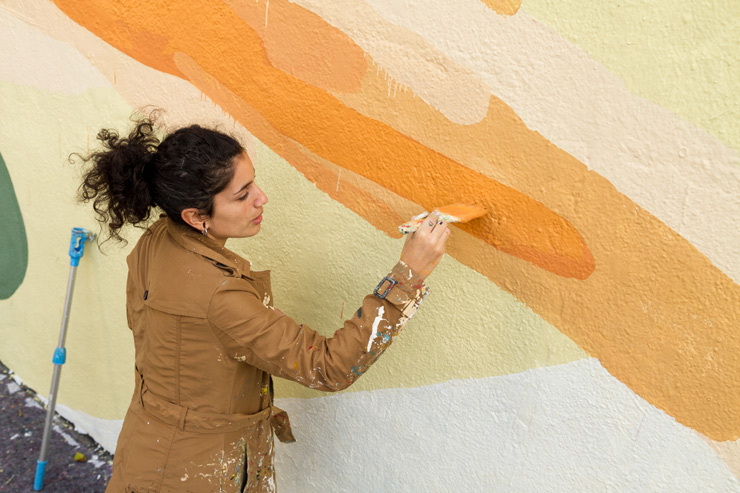 “In this artwork, nature and its forces are represented,” says the artist of the newest “12+1” project. 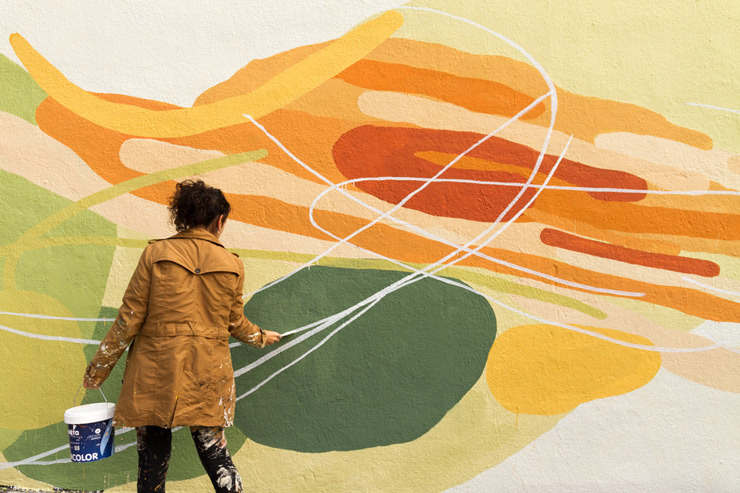 A recent act of extreme weather in Italy inspired this new mural in Sant Feliu de Llobregat by Lucia Pintos (aka Nulo) from Montevideo, Uruguay. A huge storm had devastated an entire forest, destroying thousands of trees, scattered like toothpicks across the mountains and land. Nulo says that she thinks of nature as a balance of two forces: dynamic and static. Despite the power of the wind to mold mountains and transform landscapes, she also concentrates on the static force of the trees roots, which hold them in place until they snap. You can see these forces at play in this abstraction that may also remind you of earth science diagrams, but this one does capture the energy Nulo is going for, capturing “Two equal forces that, at the same time, are completely different,” she says. 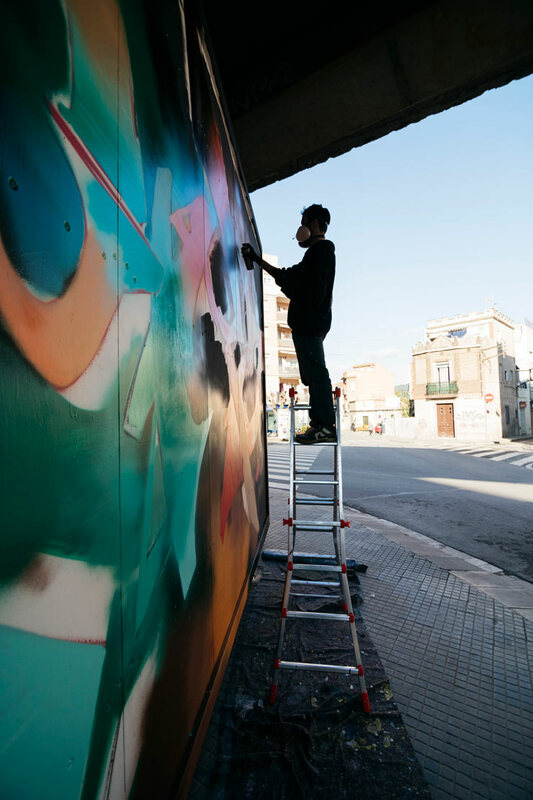 As FUNDACIÓ CONTORNO URBANO ends another year of their project called “12 + 1”, the community-based organization expands from one wall to four. 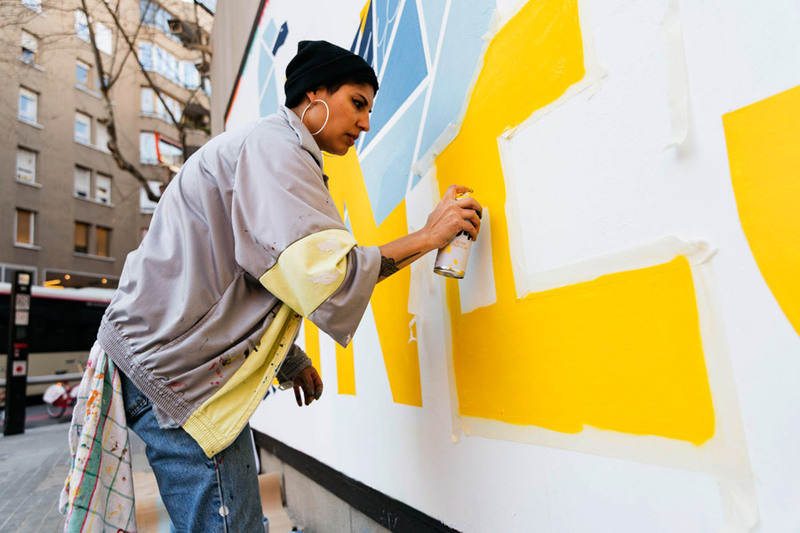 Collectively they give opportunities to artists to paint in public and to the people on the street to appreciate the processes, techniques, and motivations that artists employ in the creation. 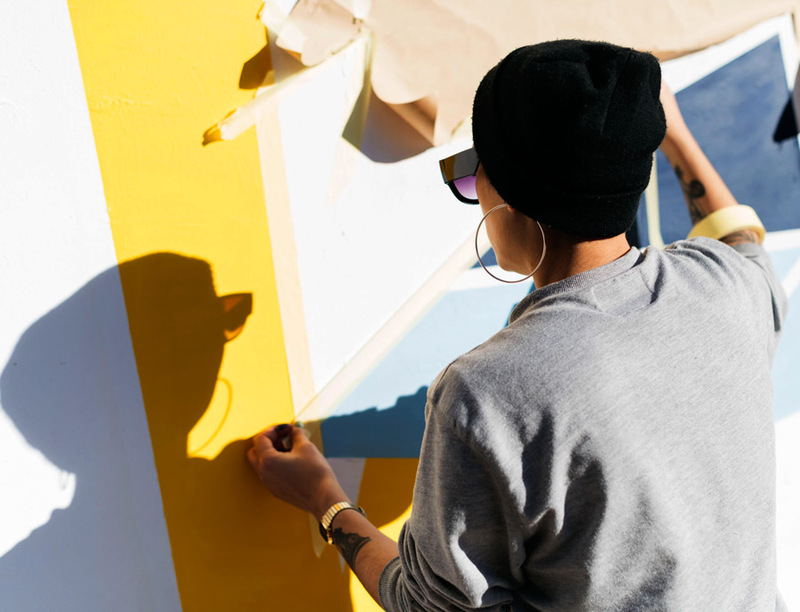 The model for engagement is similar to many yet entirely separate from previous notions of public art: an engaged responsible program that is accountable to community yet still gives wide berth to the individual styles of the artists and their need to express ideas or experiment with new approaches. 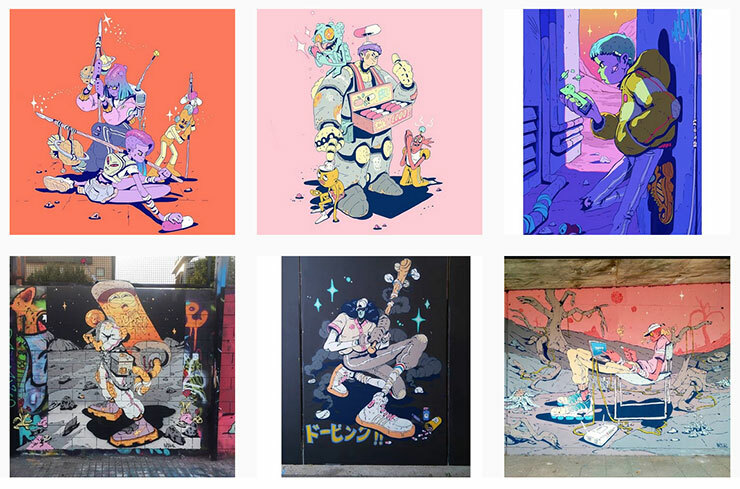 BISUAL’s post-human sallow skinned characters are laboratory inventions that contain elements of animal, chemical, organic, electronic, psychedelic – minus the superpowers or sleekness of your typical cyborg. 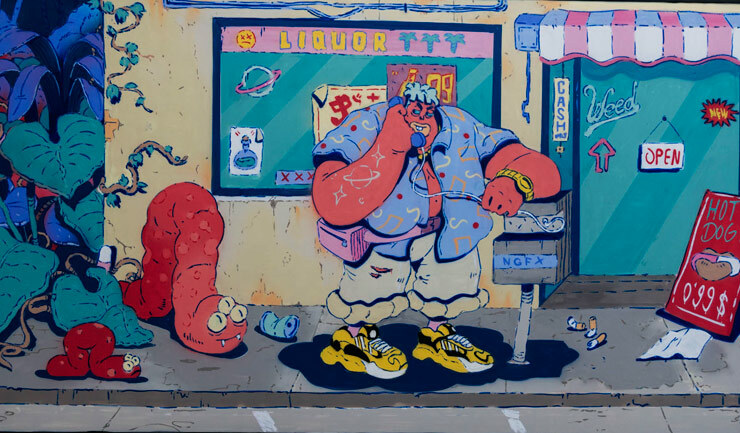 They also like to smoke something now and then while gazing at phones in a cartoon dystopia, a handful of helpers to mellow the menacing low-level paranoia. 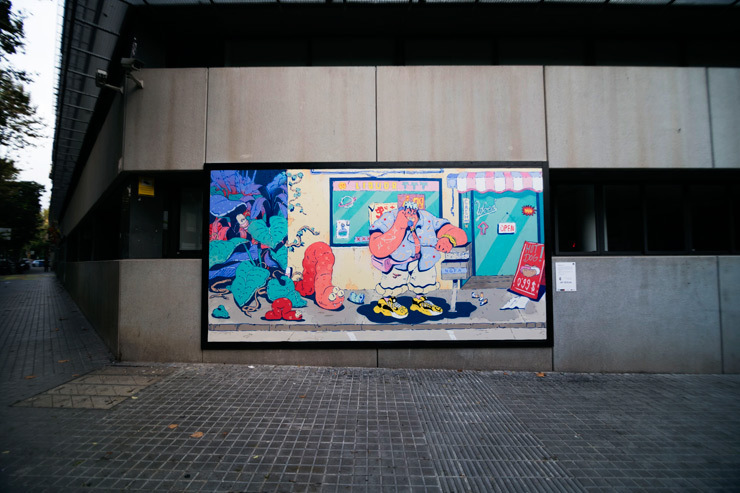 The illustrator and painter has a history with graffiti as well, which may explain his ease creating casually comic surrealities on large walls in public space, like this new one in Barcelona. 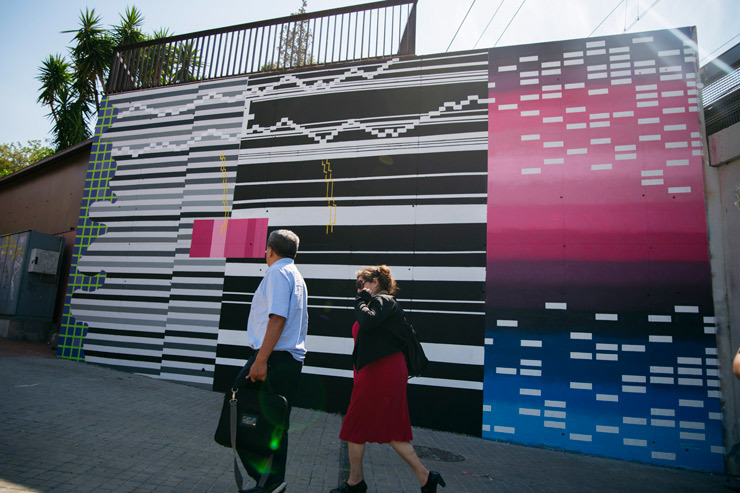 The mural features leaves of the Acanthus mollis, a common and invasive species of plant, creeping up onto the street, blended with “geometric architectonic elements” he says. The pinkish protagonist may be pausing on his way to an errand at the liquor store, or he may just be waiting for his man, €26 euros in his hand. Certainly those psycheldelio creatures from the organic wild who are slithering with wide eyes slowly up to him are attentive to his actions, perhaps listening to his words. Not that he should be concerned of course. 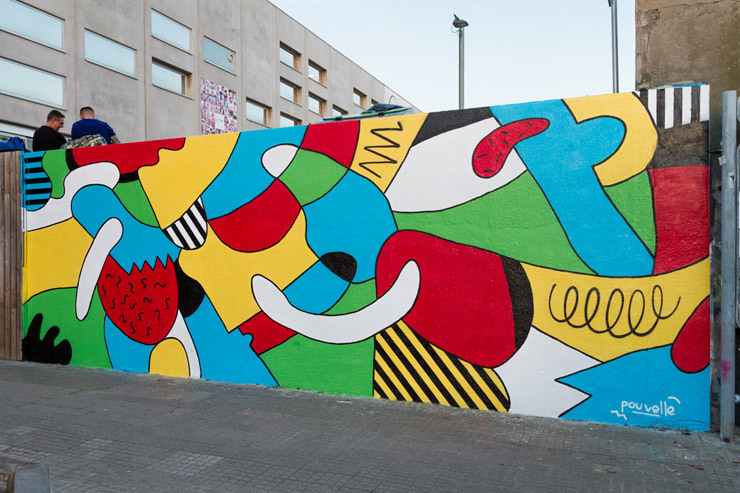 Bisual’s wall is sponsored by the Contorno Urban0 12 + 1 Project, a community powered initiative to bring artists to walls in Barcelona. 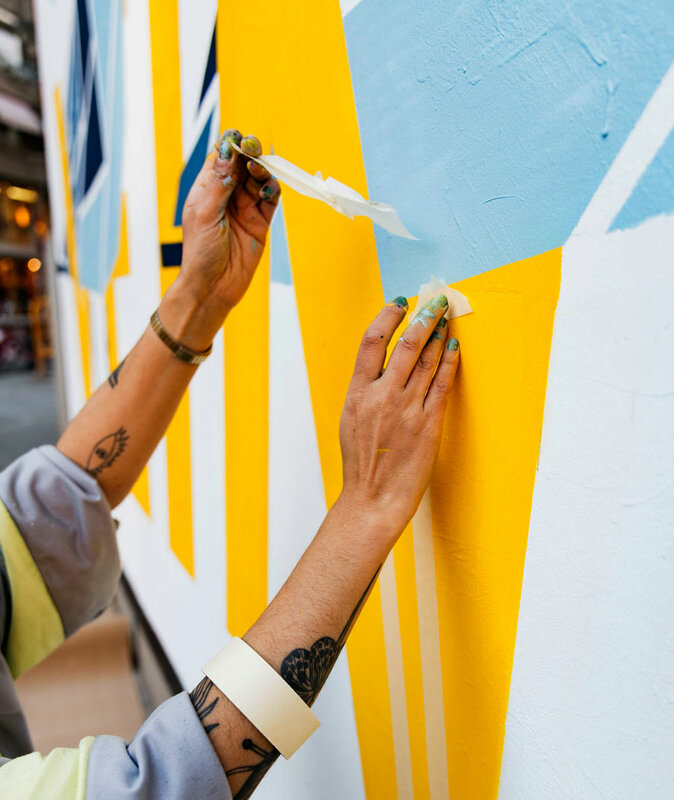 “Leave the rationality of your brain and listen to your heart, what you feel, what vibrates,” recommends ASU, the muralist painting the Contorno Urbano wall in Barcelona this month. 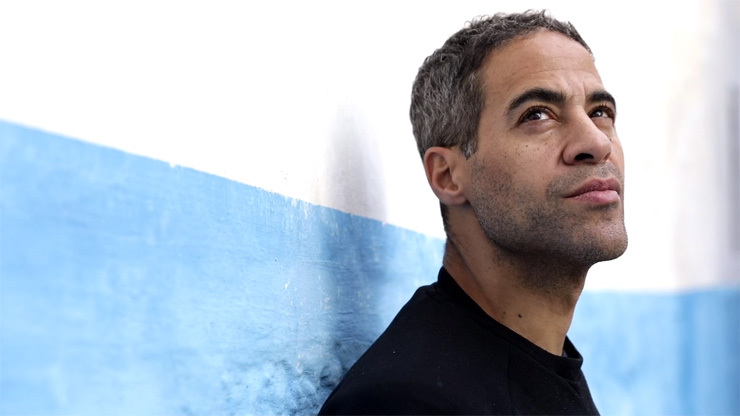 Since he was a kid the Franco-Spanish philosopher-artist says he has been inspired by sacred art and in particular the great pyramids of Egypt. 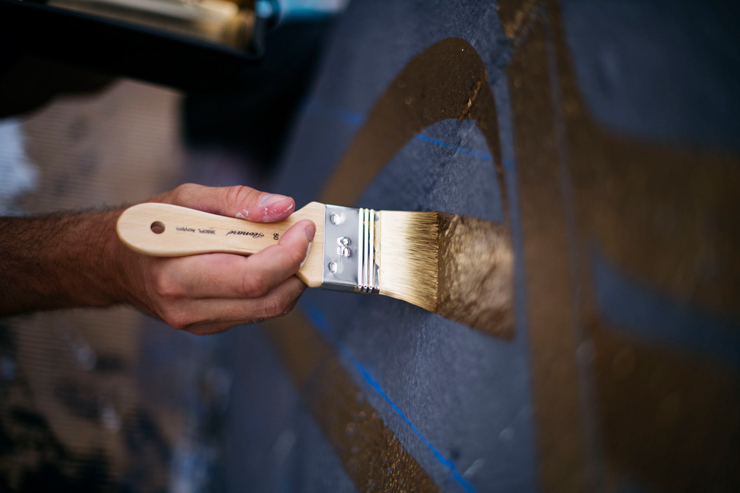 As an artist he also looks at his work for a sense of balance, and you can see that here as he fills the forms with an evenly weighted layering of gold and silver calligraphy; yin and yang. 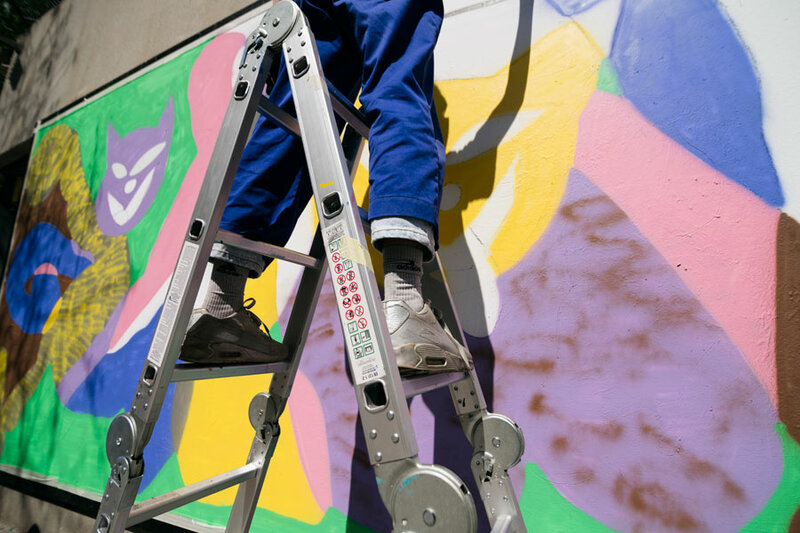 He says that he enjoys the public interaction when painting and he had plenty of it during the four grueling days he dedicated earlier in the month here. 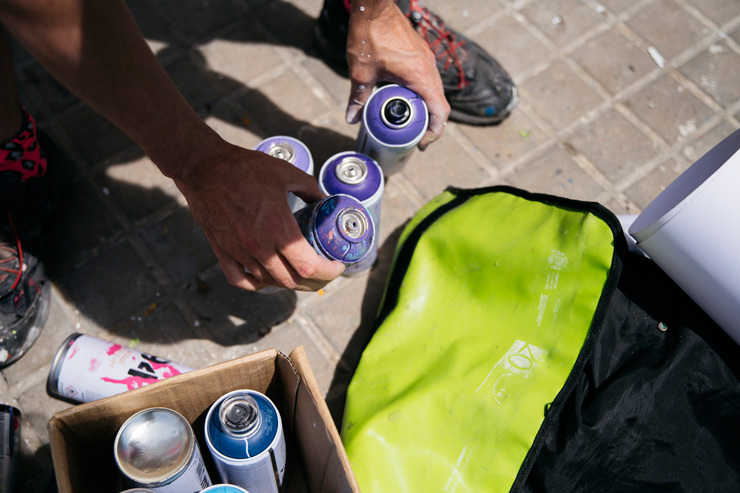 “I like to paint on the street. 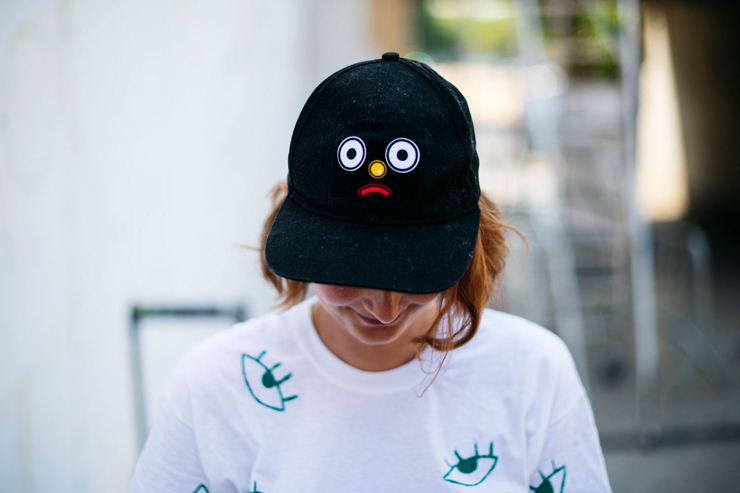 People talk to you, try to understand, bring you some snacks, something to drink. It’s very nice to receive this kind of generosity, kindness,” he says in his posting on Facebook. Now we are intermingling the spiritual and mystical with snacks. 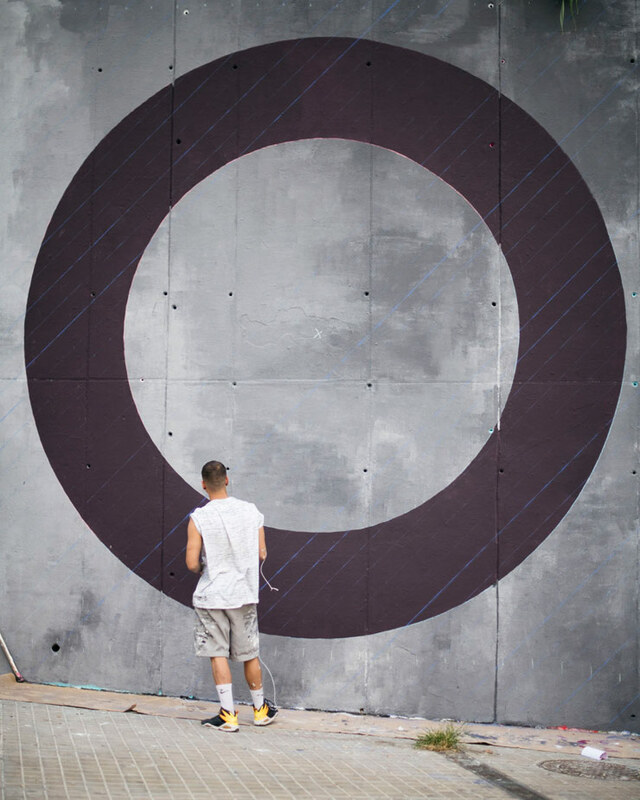 We propose that to get your mind in the right place while looking at this new calligraffitied sprinkled circle, you may wish to think of donuts. As you know the influence of the Memphis design movement is again fully present as the spirit of the 1980s Milanese architect and designer Ettore Sottass has captured the imagination of many young creatives who have tired of mid-century modern. 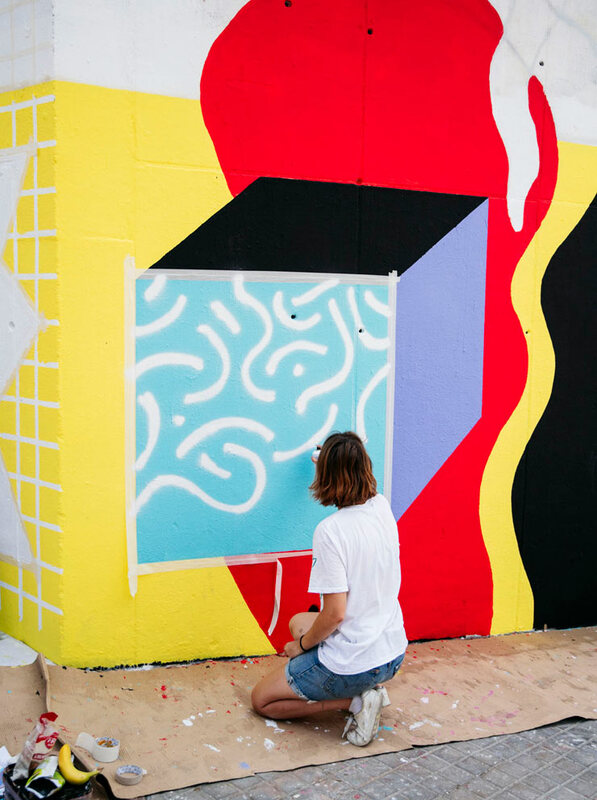 French illustrator, graphic designer and mural artist Perrine Honoré fills her days with drawing figures, flora, and scenes of domestic simplicity with the same panache of those early Memphis designers who valued form over function, played with proportion, and stacked striped, dotted, saturated pop colored geometric shapes adjacent to and on top of one another. 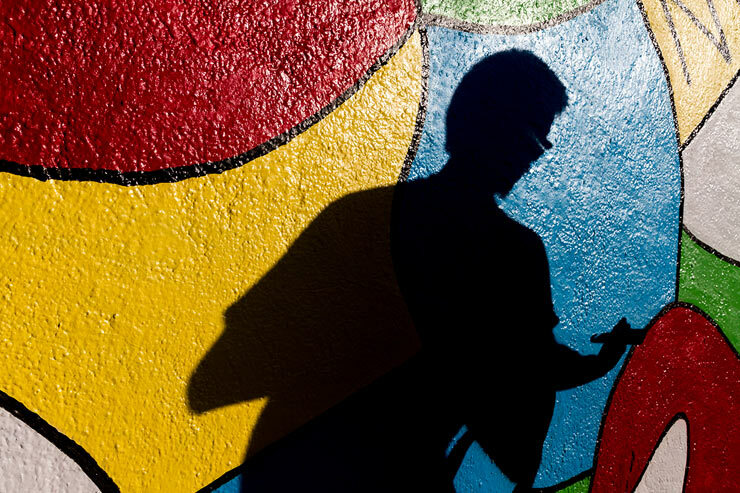 The style and world view is a frank form of communicating the complexities of life and relationships without the guile or intrigue, and certain audiences are responding positively to a sort of naïve optimism amidst the chaotic, often negative, news cycle that dominates discourse at the moment. 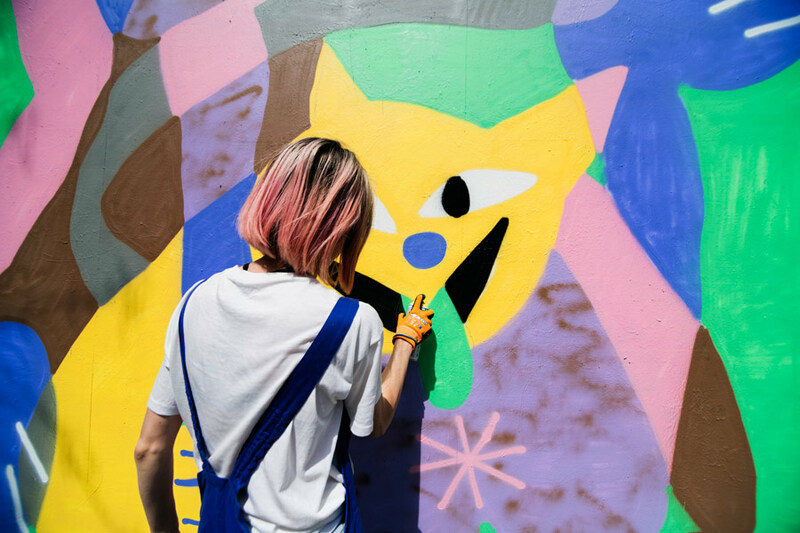 During August at the open-air art gallery called 12 + 1 in Barcelona, Honoré paints her cheerful vision in “El Barrio” (Torrassa). 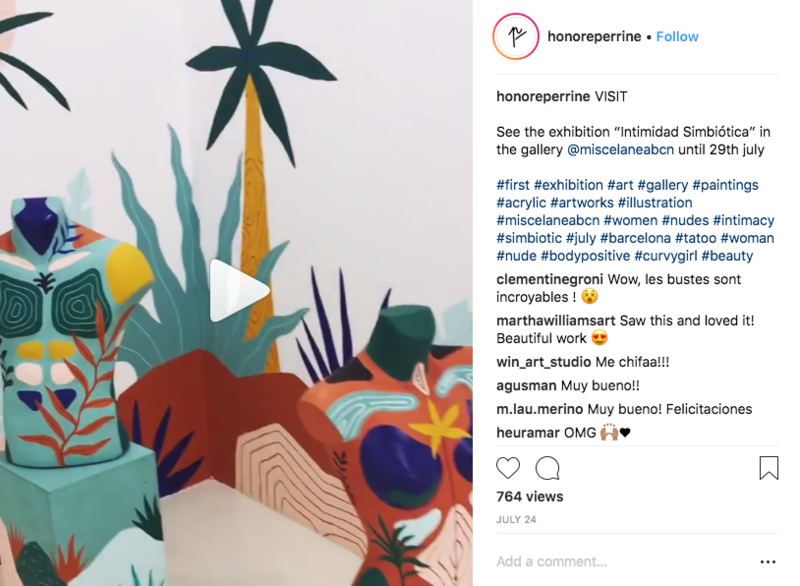 “Between abstraction and illustration, the idea is to leave the public free to interpret the work as they wish,” she says in a typical show of spontaneity. 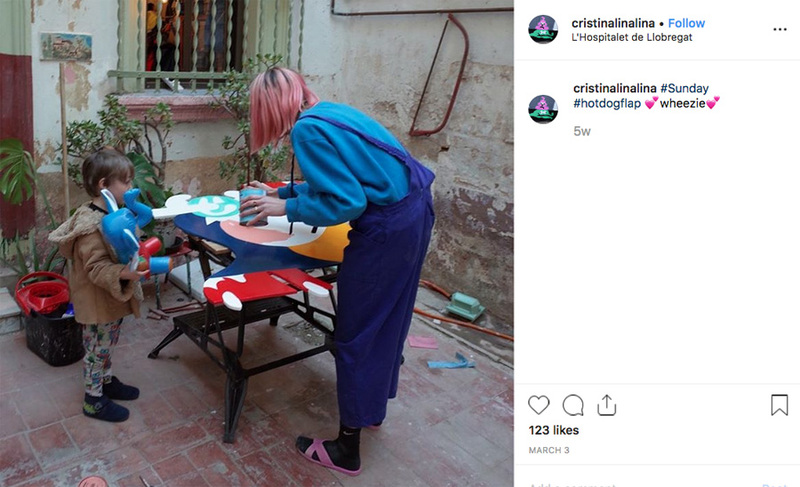 With formal training in Sweden, Paris, and Barcelona in Fashion Design, graphic design, and illustration, her lines are confident and precisely curvilinear, with a degree of playful insouciance. Guess it is time to relax, right? – most of Europe is on holiday right now anyway. 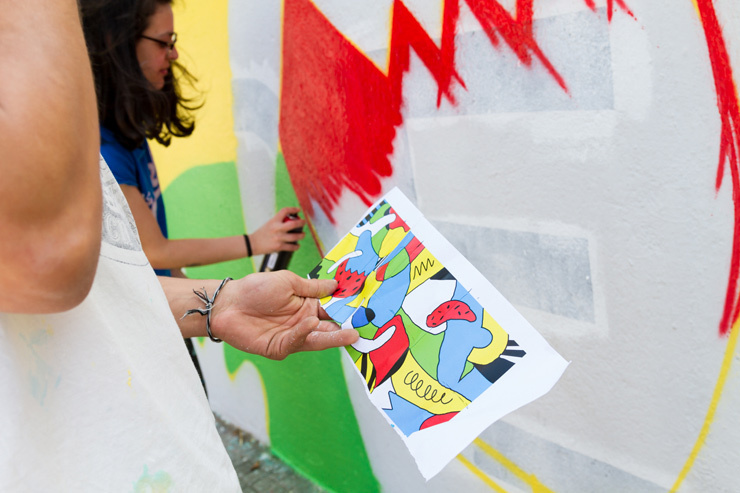 Learn more about the Contorno Urbano Foundation and their 12 + 1 Project here. 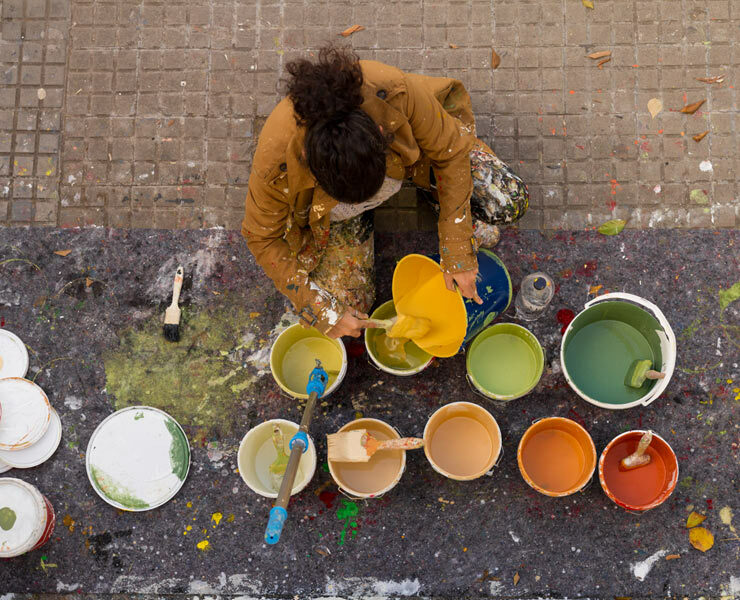 Painting on the street and the field of painting. The color field. Your field of reference. 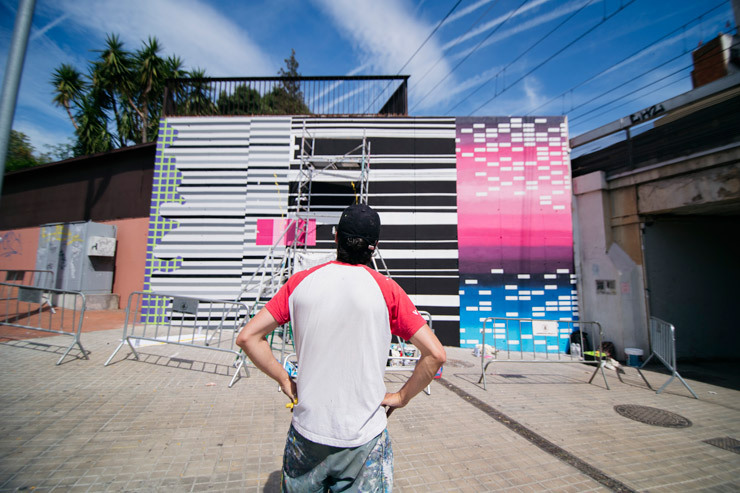 Joan Cabrer is pixelating the artificial and the natural, placing them on the same playing field. Winner of the Sotheby’s Scholarship Medal given by the Miró Foundation and participant in a number of artists residencies and gallery exhibitions since the start of his artist career a little over a decade ago, Cabrer can be seen as being from a certain generation that became romantically involved with the early years of our digital aesthetics formed from the mid 1980s to the late 1990s. Those simplistic blocked screen renderings of the world were friendly, alien, and reductive; instantly futuristic in our imaginations. At first graphic, now more painterly, his works now freely associate with the bio-scientific – static representations of flickering life and ecosystem. 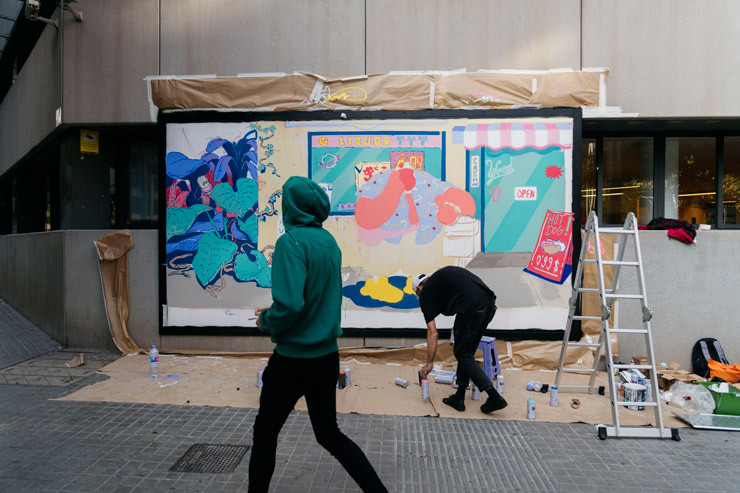 Here for his new mural created for Contorno Urbano’s 12+1 project in Barcelona, Cabrer toys with the “glitch” factor that roughly distorts, then returns us to a normality within our altered virtual reality. What point does digital mixed so often and so thoroughly that we can’t imagine the real with the virtual? This one is for Project 12 + 1.